I tried this eggless apple cake recipe using wheat flour/ atta by watching Sanjeev Kapoor’s YouTube video. As this is my first attempt of trying an apple cake at home without eggs, I followed original recipe to the dot. Chef used wheat flour and maida in equal quantities. Cake came out so soft, moist and spongy. I should call it as apple cinnamon cake because cinnamon acts as the major flavoring ingredient. When the cake is baked, I could feel a nice fruit smell with cinnamon all over the house. We all loved it. During Christmas season, most of us like to bake a fruit cake at home. 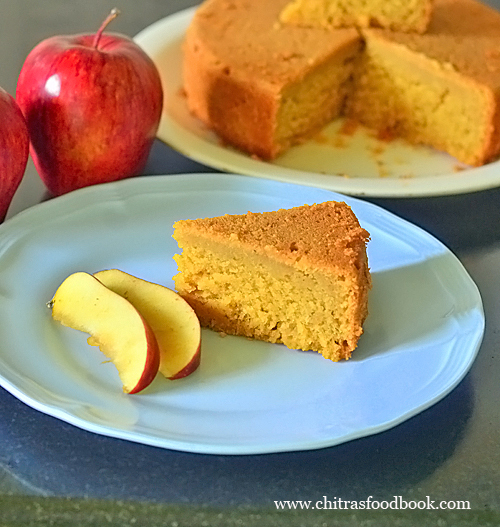 If you are bored with the regular dry fruits cake, you can try this eggless apple cake instead. The best part is you can make this cake in microwave mode, convection oven and in a pressure cooker as well. Actually I baked 3/4 th of the batter in convection mode and the remaining in microwave mode by keeping in a glass bowl. Both turned out great. Convection oven cake took nearly 40 minutes of baking time whereas in microwave it was done under 4 minutes. So you can bake this eggless apple cake in microwave mode or convection mode in your oven. If you want to bake the same in pressure cooker, it is also possible. Just spread 1 inch of powdered salt in a thick cooker bottom. Put a small plate or slotted plate over the sand, preheat the cooker for 15 minutes in medium flame till salt is heated. Remove the gasket and weight valve from the lid and cover the cooker. After preheating, place the baking pan and cook for 20 to 30 minutes in low flame. Check with a tooth pick & remove after cooling down. This recipe is so versatile and it works great for all the baking methods. 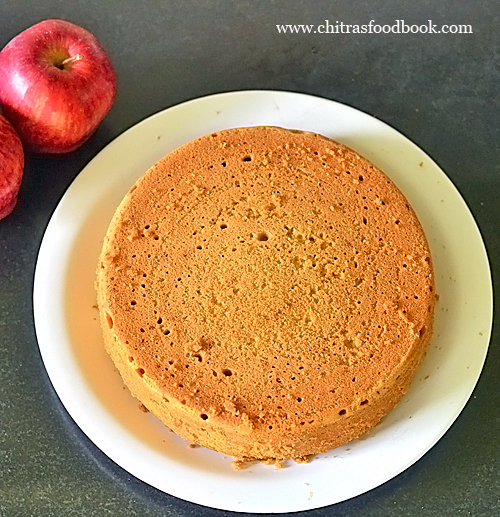 Friends, do try this eggless apple cake recipe and share your feedback with me. Hope the step by step pictures can help you better. I will try to share the video recipe soon. Check out my eggless orange cake, eggless dates cake with wheat flour, eggless christmas fruit cake recipe, eggless plum cake in pressure cooker, microwave fruit cake too. 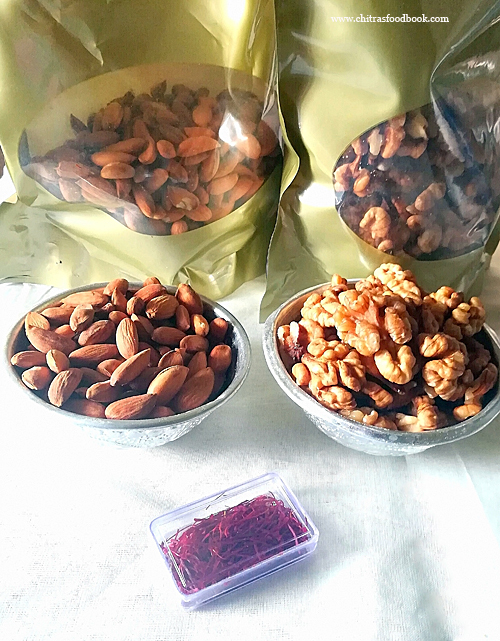 Recently I got a pack of original, high quality almonds, walnuts and organic saffron from Kashmiri online store. I loved their walnuts and saffron. I have never used such a fragrant saffron till now. I could feel the aroma of it even before opening the parcel.. Friends, do check out their website and order the products. I am sure you will love its quality 👍. Eggless apple cake recipe with wheat flour , all purpose flour, butter and milk. Wash and chop apple into small cubes. Grind to a puree adding water. In a wide bowl sieve wheat flour, maida, baking powder, baking soda and cinnamon powder. In another bowl mix melted butter, milk, vanilla essence and apple puree. Add the sieved dry flours and mix without lumps. Lastly add 1 tbsp cooking oil and mix well. Transfer the apple cake batter to a greased baking pan. Bake in a preheated convection oven for 40 minutes. Check with a tooth pick and remove the cake after warm. For microwave apple cake, take 1/2 cup of cake batter in a microwave safe glass bowl. Cook for 4 minutes. Remove it by checking with a tooth pick. Enjoy when warm. Apple cake stays good only for 2 days. So try to consume it quickly. Wash and cut apple into small cubes. Grind to a smooth puree adding 1/2 cup of water. Set aside. In a wide bowl, sieve wheat flour/ atta, maida, baking powder, baking soda and cinnamon powder. Keep it aside. In another bowl, mix melted butter, milk, vanilla essence and apple puree. Add sieved dry flour to the wet milk mixture. Add little by little and mix without lumps. Batter should be thick and pourable. It will fall like a ribbon. Lastly add 1 tbsp cooking oil. Mix well. Take an aluminum baking pan. Grease it with butter. Sprinkle maida all over the pan and dust off the excess flour. Pour the cake batter to the pan. Fill 3/4th of the pan. Pat the pan to level the batter and break the air bubbles. Preheat the oven in convection mode at 180c. Place the baking pan and bake at 180c for 35 to 40 minutes. Cake rises and cracks on top. No issues. After 30 minutes, open the oven and insert a tooth pick or knife in the middle of the cake. If its sticky or with batter, bake for another 5 to 10 minutes. If the knife comes out clean, cake is done. Remove the baking pan and set aside to cool down. After the cake becomes warm, run a knife around the cake and loosen the sides. Invert the cake in a plate and remove it. Make pieces and enjoy ! This cake stays good only for 2 days if kept outside. Refrigeration is not advisable because cake may become dry. So its better to consume soon. FOR MICROWAVE APPLE CAKE : Take 1 cup of apple cake batter in a big glass bowl. Microwave in high power (800w) for 3 to 4 minutes. Check with a tooth pick and remove it. Invert in a bowl after cooling down. You can use wheat flour completely instead of atta and maida half and half. But cake looks dense and thick. Not fluffy as shown in the picture. You may need to add more baking soda too. You can use brown sugar instead of white sugar for healthy options. 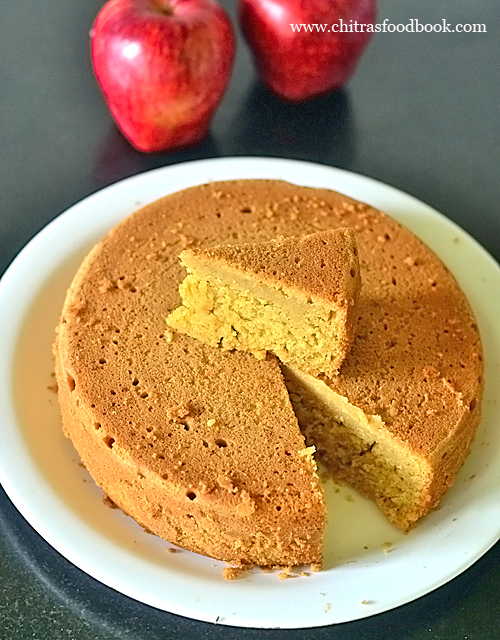 Try this eggless apple sponge cake at home and enjoy ! I had bookmarked this Indian style, vegan eggless mango cake without condensed milk from Madhuram’s eggless cooking blog. But I couldn’t try it. So I thought of trying at least in this mango season. 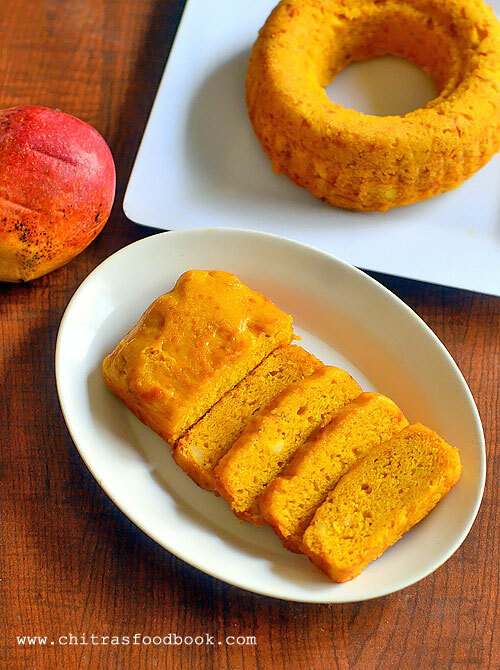 Basically eggless mango cake can be prepared with many variations in the ingredients. Today I have come up with a version of mango cake with minimum ingredients. This cake recipe doesn’t call for butter, curd/yogurt, milk or condensed milk. Yes, Its completely vegan. Its a very simple recipe that uses cooking oil as the major ingredient. 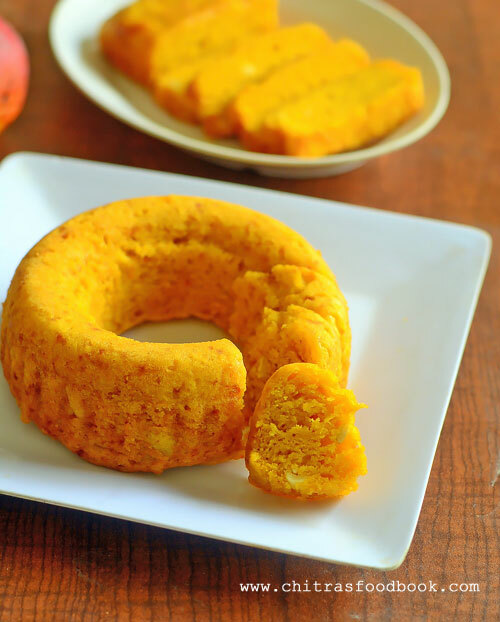 You will love this soft and spongy eggless, butter less mango cake. You can try this cake in a pressure cooker as well. Please refer my eggless cooker cake post for detailed procedure. If you ask me for wheat flour as substitute, sorry I can’t help you. Cake may become dense with wheat flour. Soon I will try to post a separate recipe for wheat flour mango cake. Ok, lets see how to make easy, Indian style vegan eggless mango cake recipe with step by step pictures and video ! Check out my super hit eggless Dates cake with wheat flour and oats ! Also check out my eggless whole wheat flour digestive cookies. Wash and peel the skin of ripe mango. Chop, grind and take the pulp. In a wide bowl, take the mango pulp, cooking oil, sugar, vanilla essence and cardamom powder. Mix well till sugar dissolves completely. To this mixture, sieve and add maida, baking powder and salt. Add nuts. Mix gently to make cake batter. Grease a baking pan with oil and maida. Preheat convection oven, bake at 180c for 25 minutes. Check with a toothpick. Invert cake in a plate after it cool down completely. Make slices and serve. Enjoy ! To make eggless mango cake, wash and peel the skin of 2 ripe mangoes. Chop to cubes. Grind to a smooth, thick paste without adding water. Alternatively you can use store bought, readymade mango pulp too. Measure 1 cup of puree and set aside. In a wide bowl, take the mango puree. Add sugar, cooking oil, vanilla essence and cardamom powder. Mix well until sugar dissolves completely. Place a sieve over the mango puree bowl and add maida, baking powder, baking soda and salt. Sift and add to the mango puree. Lastly add the chopped cashew nuts. Mix gently without lumps using a spatula. Batter would be semi thick and spoonable. Check for taste, add more sugar if needed. Mix gently and set aside. Take a baking pan and grease with oil. Sprinkle 2 tsp of maida all over the pan and rotate it to spread well. Pat and remove the excess flour. Now transfer the cake batter to the baking pan. Fill the batter till half of the pan. I used 2 small sized pans ( bundt pan & loaf pan). Preheat oven in convection mode at 180c. Bake the cake for 25 minutes at 180c. Remove the pan after 25 minutes and insert a tooth pick into the cake. If the tooth pick comes out clean or with slight crumbles, cake is done. If toothpick comes with cake batter , bake for another 2 to 5 minutes by checking every minute. Cool down the cake in a kitchen counter by covering the cake with a plate. It helps to prevent the cake from drying on the top. After 15 to 20 minutes, take the pan and run a knife around the corners of the pan. Invert the pan to a plate and pat it. Cake falls off easily. Make slices and enjoy with your tea/coffee. Tastes great with a nice mango flavor. Enjoy ! Do not reduce the quantity of baking powder or baking soda. Adjust the quantity of sugar based on the sweetness of mango pulp. Original recipe used 1/2 cup sugar but I used 2 tbsp extra. Do not beat the cake mixture. Mix gently. For variations, you can use powdered sugar. In that case, measure and grind 1/2 cup + 2 tbsp & add to cake batter. If you like, you can replace a part of sugar with honey. 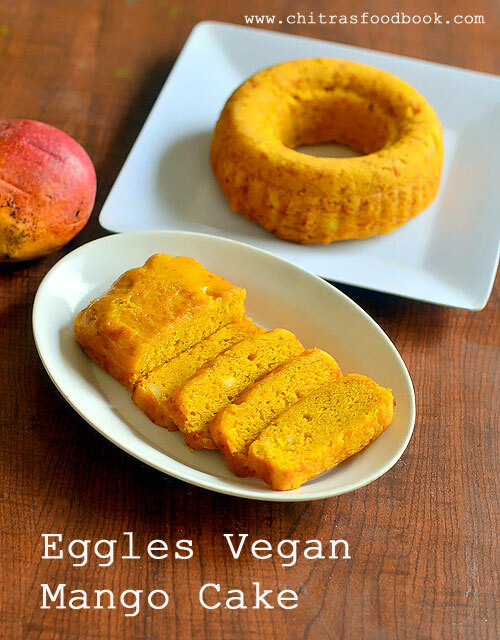 Try this eggless vegan mango cake recipe at home and enjoy your teatime ! Ice cream bread/ Ice cream cake is an easy 2 ingredient bread baked using all purpose flour / cake flour and melted ice cream. Recently I prepared homemade Vanilla ice cream and Butterscotch icecream using Amul fresh cream and condensed milk. I used the leftover ice cream for this recipe. After referring so many recipes, I found full fat ice cream works the best for this ice cream bread recipe. But I tried with ice cream prepared using low fat Amul fresh cream. Still my bread came out very well and soft. Basically this ice cream bread tastes bland with mild sweetness. So I modified the recipe and added some powdered sugar, milk. It came out very well, soft and spongy. Raksha loved it very much. You too give a try in this summer vacation for your kids. They will love it for sure. Vanilla ice cream is preffered but you can try with other flavors as well. I used vanilla ice cream and butterscotch ice cream in equal quantity. So the color of bread varies as per the ice cream you use. Ok, lets see how to make easy, yummy, homemade ice cream bread recipe at home using leftover ice cream. Check out my homemade custard powder ice cream, mango ice cream recipes without using ice cream machine. Learn how to make easy ice cream bread recipe using leftover ice cream and all purpose flour. Melt the ice cream and take in a bowl. Sieve all purpose flour, baking powder, salt, powdered sugar and add to ice cream. Add cooking oil and mix well to make batter. Transfer to a greased loaf pan. Preheat convection oven at 180c. Bake for 25 minutes till tooth pick comes out clean. Cool for 15 minutes and remove the bread. Make slices and enjoy. In a wide bowl, take melted ice cream. Place a sieve over the bowl. Add all purpose flour, powdered sugar, salt, baking powder. Sieve and add to ice cream. Add cooking oil and mix everything well to make bread batter. Batter should be thick but pourable as shown in the picture below. Grease a loaf pan with cooking oil and dust all purpose flour all over the pan. Transfer the bread batter to the pan. Preheat convection oven at 180c. Bake the bread for 25 minutes. Remove the bread, insert a toothpick and check if it comes out clean. If so, cake is done. Cool the bread for 20 minutes. Run a knife in the corners of pan. Invert the pan over a plate and remove the bread. It comes off easily. Make slices and serve immediately. It kept it for 2 days. Vanilla ice cream is preferred for this ice cream bread. You get white colored bread slices. As I used vanilla and butterscotch in equal proportions, my slices came out golden in color. You can skip cooking oil if you use full fat ice cream. Try this easy ice cream bread at home and enjoy your teatime ! My daughter Raksha is a big fan of Red velvet cake. So I tried eggless red velvet cake recipe at home with whipped cream frosting for the first time on Valentine’s day. Last year during this day I had shared a simple and easy eggless red velvet cake in a mug using microwave. So this year I wanted to try in convection oven. It came out moist, soft, spongy without even using condensed milk, butter & eggs. Cooking oil and buttermilk are the magic ingredients in this recipe. I was very happy with the result even though its my first attempt. Thanks Ranjani for the fool proof recipe. Actually cream cheese frosting is most suitable for red velvet cake. But I used heavy whipping cream for the frosting as I din’t have cream cheese in hand. We loved this combo as well. I used food coloring liquid for the bright red color. I din’t want to test with beetroot juice as its my first attempt. Last year we ordered red velvet cake from a popular bakery chain for Raksha’s birthday. But it was not good at all. We were disappointed with the taste of frosting and felt the cake was not even moist. When compared with that cake, my homemade eggless red velvet cake is outstanding. Beginners can dare to try this recipe. You will get good results for sure. You can also use this recipe to make red velvet cupcake. 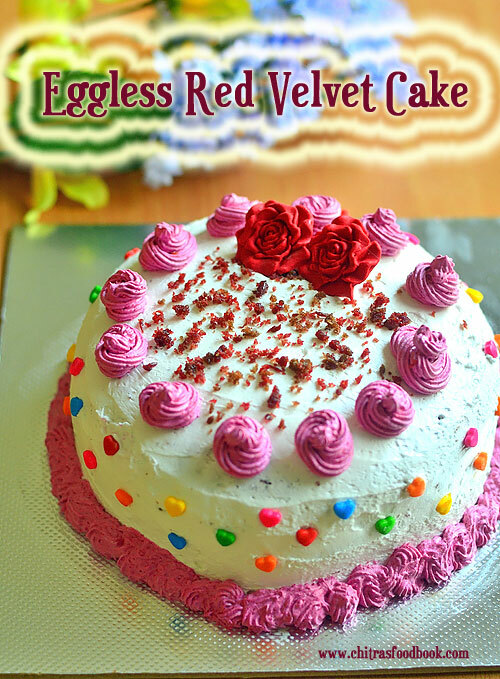 Ok, Lets see how to make eggless red velvet cake at home with step by step pictures. PS : Sorry for the bad decoration. I am still in the learning phase. Hope I can do a perfect frosting soon ;). 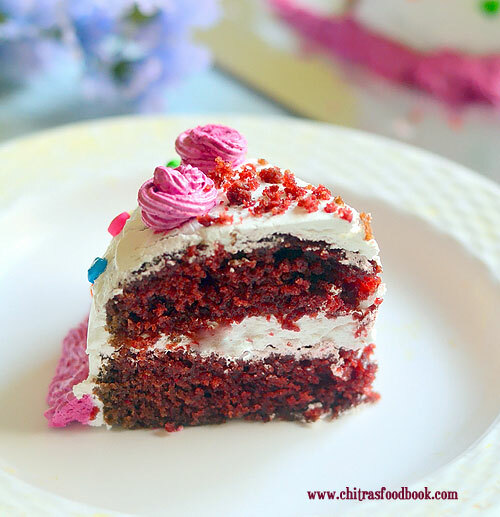 How to make soft, moist eggless red velvet cake without condensed milk. Sugar + water – 1 tbsp each for sugar syrup. In a small bowl, whisk curd & water to make buttermilk. Keep aside. In another wide bowl, take sugar and cooking oil. Mix till sugar melts.Then add the remaining wet ingredients and make a smooth liquid. Keep a sieve over this bowl. Sieve maida, baking powder, soda and cocoa powder. Mix gently with a whisk to make cake batter. Transfer to a greased baking pan. Bake in a preheated oven for 30 to 35 minutes.Check with toothpick. Remove the pan and let the cake cool completely. Invert in a plate and cover with a cling wrap to avoid drying. Now beat the heavy whipping cream adding icing sugar, vanilla essence till stiff peak using electric beater. Slice the cake into two rounds. Drizzle sugar syrup all over the cake base. Apply frosting.Decorate with piping nozzles as you like. Refrigerate the cake for an hour before use. Cut the cake and enjoy chilled cake. In a small bowl, whisk thick curd + water. Make buttermilk. Set aside. In a wide bowl, whisk sugar and cooking oil. Mix till sugar dissolves. To this add buttermilk, vinegar, vanilla essence, food color and mix well. Place a sieve over the bowl. Sieve maida, baking powder, baking soda and cocoa powder. Mix gently and make the cake batter. Batter consistency should be pourable and fall like ribbon. Take a baking pan, grease with cooking oil or butter at the sides & bottom pf pan. Dust the pan with maida & coat it completely. Pour the cake batter till half of the pan. Preheat convection oven at 180c for 10 minutes. Place the baking pan inside the oven and bake the cake for 30 minutes. Prick the cake with a toothpick and check if it comes out clean without batter. If not, bake for another 2 minutes to 5 minutes. Remove the cake pan and allow it to become warm. After 30 minutes, run a knife in the sides of cake and invert it in a plate.Cake falls smooth without sticking to the pan. Let the cake cool down completely if you are frosting it with cream. Else you can make pieces and serve warm as teatime cake immediately. After the cake cools down completely, cover the cake in a cling wrap or polythene cover and rest it for 6 hours to overnight. This will help to slice the cake without or with less crumbs. But If you want to apply icing on the cake, you can also slice it once the cake becomes warm but crumbs will be more. No problem, you can collect the crumbs and use it for decoration. Now remove the cling wrap. Slice into two using a knife or thread.Cut the cake into two roundels using a knife or thread as shown the picture below. Place the base on seperate plate. Drizzle sugar syrup on both the layers. Do not add too much of sugar syrup. Cake base will become soggy. Stop adding sugar syrup once you feel the cake is completely wet by pressing with your fingers gently. To make frosting, take the heavy whipping cream in a wide bowl. Add icing sugar, vanilla essence. Whip it using an electric beater till soft peaks form. Remove more than half of this cream to another bowl and use it to apply on the cake base. Beat the remaining cream till firm peaks, add food color to a portion of it ( I used pink) and use it for piping. Apply cream on the cake base and layer the cake one over the other. Cover the top and sides with the cream. Now take the piping bag and insert a nozzle. Fill with cream. Decorate the cake as you like. If there are crumbs in the cake, you can sprinkle them all over the cake. Refrigerate the cake for an hour and then cut it. Enjoy ! Do not reduce the quantity of cooking oil. Instead you can replace with soft butter. To substitute buttermilk, you can use 1/2 cup warm milk + 1 tsp lemon juice. Baking time may vary as per the oven settings. So keep an eye after 25 minutes. After you apply frosting on both of the cake base, refrigerate it for 30 minutes to set well. Then you can layer them and give the top coating. After coating the sides and top of the cake, again refrigerate it for 30 minutes. Finally you can do the piping design, refrigerate for 1 hour and cut it. All these steps helps to make the frosting set well. 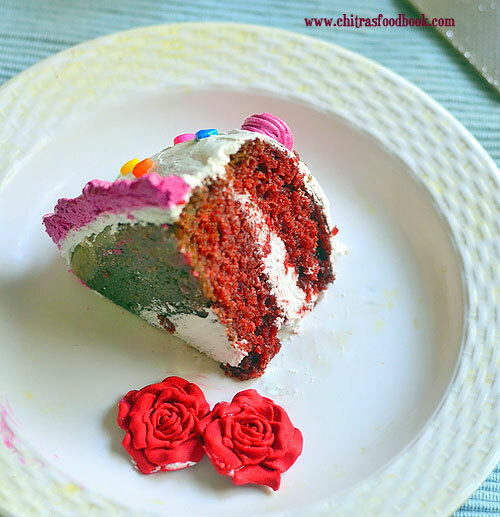 Make this rich, creamy, soft, spongy, delicious looking eggless red velvet cake at home for birthdays, anniversaries and special occasions, enjoy ! 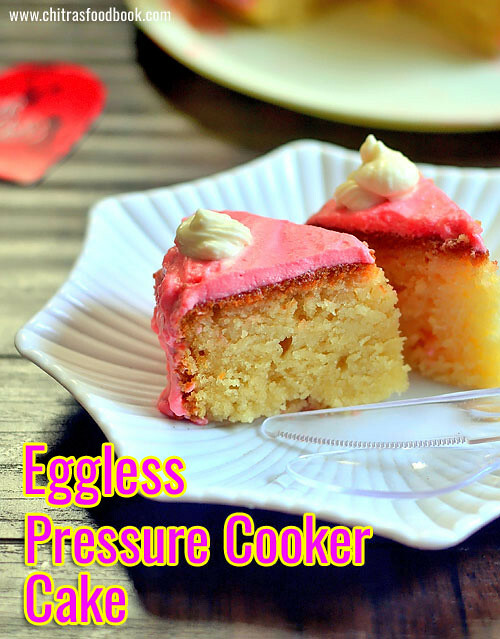 Eggless vanilla cake using a pressure cooker is my long time pending readers requested recipe. Many readers who tried my eggless cakes using convection oven had requested me to share some eggless cake recipes using a pressure cooker. Long back I had shared an eggless chocolate cake in a pressure cooker. But its procedure and recipe is completely different from the usual cooker cake. I used water in the bottom of cooker instead of salt or sand. Today I have shared the proper & perfect pressure cooker cake using powdered salt. I followed my eggless tutti frutti cake recipe and made it using pressure cooker instead of baking in oven. This simple, eggless cake recipe is made without using condensed milk or butter. Curd and cooking oil are the major ingredients. Cake came out really well, spongy and very soft as expected . The texture of the cake is equally great with the oven ones. There is no much difference in baking time as well. This vanilla sponge cake can be used as the base, decorate it with simple frosting and enjoy for birthday & anniversary celebrations Or it can be relished as simple tea time cake as well.For variations, you can mix in some tutti frutti to make this cake colorful. Friends, do try this cake during this vacation for your kids. I am sure you will get perfect results. I tried frosting the cake using Amul fresh cream.It tasted great but its texture was not so perfect. Soon I will try to make a simple and easy frosting recipe using fresh cream and share here. Lets see how to make eggless vanilla sponge cake in a pressure cooker with step by step pictures and video ! 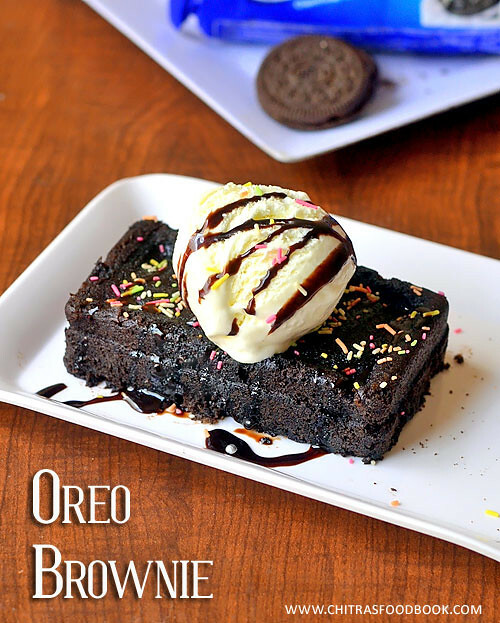 This is a super easy and quick eggless brownie recipe using Oreo biscuit in microwave under 2 minutes. I have already shared an eggless microwave Oreo cake which is a super hit recipe in my blog. After that, I couldn’t try and share any Oreo based recipes in my space. For this Valentine’s day celebration, I wanted to post some simple, quick and easy recipes. When I saw this easy Oreo cookies brownie recipe in THIS video, I was so tempted to try it. This is my first attempt of making a brownie with biscuit base. It came out really well and tasted mildly sweet, chewy, soft and fudgy. Myself and Sendhil enjoyed it a lot. I served the warm brownie with a scoop of Ice cream and topped with some Hershey's chocolate syrup. Its a prefect dessert ! Our Valentine’s day celebration started with this brownie today .Friends, If you are looking for some quick and easy Valentine’s day recipes, this is for you . All you need is a pack of Oreo biscuit, milk, very little butter and baking soda.This is one of the best Oreo recipes ideas. Don’t hesitate to try it, just go on. Everybody would love its taste for sure .Ok, enough of hype, Lets check how to make this eggless, microwave Oreo cookies brownie recipe with step by step photos and a video. Do check out my 1 minute microwave brownie recipe too !